2 oz. 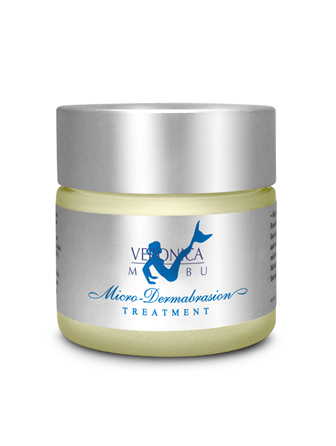 – The Veronica Malibu Micro-Dermabrasion Treatment is a resurfacing cream that gently exfoliates the skin to help minimize fine lines, pores and wrinkles. Natural fruit enzymes, vitamins, herbal extracts and marine salts enhance the process by stimulating the production of new and healthy skin cells. 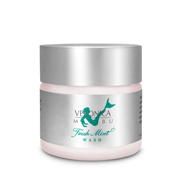 The marine salts assist in the reduction of sun damage and scarring. 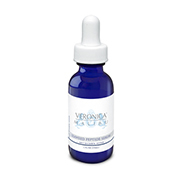 Revives dull skin and smoothes skin's texture after one treatment. Aloe Vera, Hyrogenated Polyisobutane, Stearic Acid, Cetyl Alcohol, Sodium Alginate, Glycerin, Refined Aluminum Oxide, Chamomile, Thyme Leaves Extract, Methylcellose, Safflower Oil, Dimethicone, Micronized Sodium Chloride (Salt), Bromalain Enzymes, Papain Enzymes, Lecithin, Calendula Extract, Rosemary Extract, Vitamin E, Vitamin A, Allantoin, Sodium PCA, Pheonoxyethanol, Potassium Sorbate, Sodium Benzoate. Apply a small amount to a clean, damp face. Massage gently in circular motion for 30 seconds. Avoid eye area. Rise throughly, then follow with a moisturizer. Use 1 to 2 times a week.